The R-PLEX Human Serpin E1 (total) Antibody Set includes a matched capture and detection antibody pair and calibrator for the quick and easy measurement of Serpin E1 (total) in biological samples. R-PLEX products leverage MSD’s electrochemiluminescence technology for better sensitivity and a larger dynamic range than traditional ELISAs. R-PLEX matched antibody sets enable the development of singleplex and multiplex immunoassays. Individual assays may be developed using MSD avidin- or streptavidin-coated plates. Custom multiplex assays with any combination of R-PLEX analytes, as well as R-PLEX plus U-PLEX analytes can be developed on U-PLEX MULTI-SPOT plates. To learn more about the advantages of R-PLEX products click here. 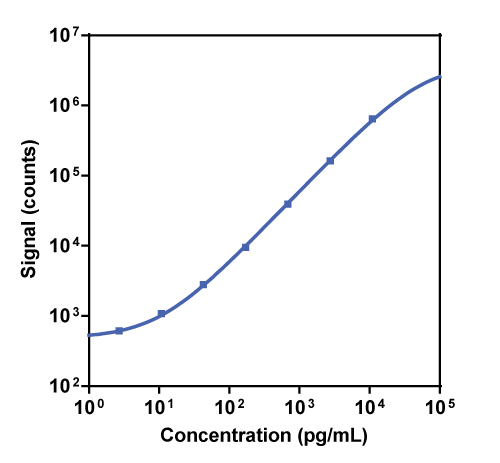 Calibration curve for the R-PLEX Human Serpin E1 (total) Antibody Set was assessed and representative data are presented below. Description - Serpin E1 (Serine Protease Inhibitor E1, PAI-1, PAI, PLANH1, Plasminogen Activator Inhibitor 1) exists in three forms. The active form is an inhibitor of both urokinase-type plasminogen activator (uPA) and tissue-type plasminogen activator (tPA). Serpin E1 has been implicated in many thrombotic disorders. It is also involved in cell adhesion, migration, and tumor invasion. There is also an inactive form, and a substrate form that can bind substrate, but not modify it. The (total) assay recognizes all three forms.